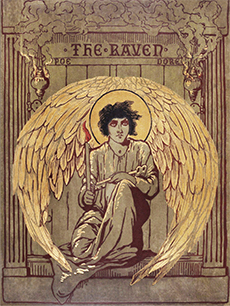 The great nineteenth century artist, Gustave Doré, illustrated Poe's classic poem, "The Raven," but the book was published with the text in one section and the illustrations in another. This is the only edition that includes the text of the poem on the pages facing the appropriate illustrations, so you can read Poe’s poem while enjoying Doré’s art. Edgar Allen Poe was a central figure of the American romantic movement in literature, as both a poet and a writer of fiction. He was one of the inventors of the horror story and of the mystery story. The Raven, written in 1845, was his most successful poem. Poe’s father abandoned his family at the time of his birth, and his mother died when he was one year old: his difficult childhood and the financial difficulties that came from supporting himself by writing undoubtedly contributed to the overwrought emotional tone of his works. He died in 1849, at the age of 40, after he was found wandering the streets of Baltimore in a delerium, wearing clothing that was not his own and talking incoherently. The cause of his death is not known. Gustave Doré was an artist, sculptor, and one of the greatest book illustrators of the nineteenth century, famous for his illustrations of Don Quixote, The Rime of the Ancient Mariner, Paradise Lost, Idylls of the King, the Divine Comedy, and other books. A New York publisher paid him 30,000 Francs for his illustrations for The Raven, published in 1884. France made him a Chevalier de la Legion d’honneur in 1861. He died at the age of 51 in 1883. Poe’s writing and Doré’s illustrations make this work one of the most beautiful books of the nineteenth century. This edition reproduces the cover and title page of the first American edition, as well as reproducing all of Doré’s illustrations.